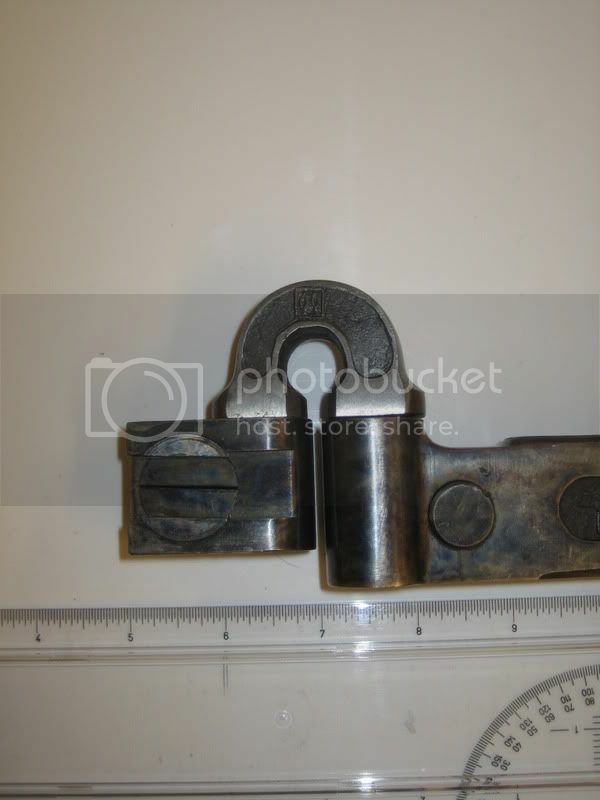 And here is a cute little one I found ages ago.... it has a 5/16" x 7/16" shank...... the part I like is the little wrench that stores in the back..... also notice on the bottom it has a feature of a dovetailed slide to let it spring but not move side to side. Another thing is I wonder if the inner spring is removable to give it both a soft and stiff setting????? With the grinding marks I would guess it to be early 20th century. No maker's marks on yours, either? Definitely a cutie. Love those beautiful reliefs on the sides of the shank. 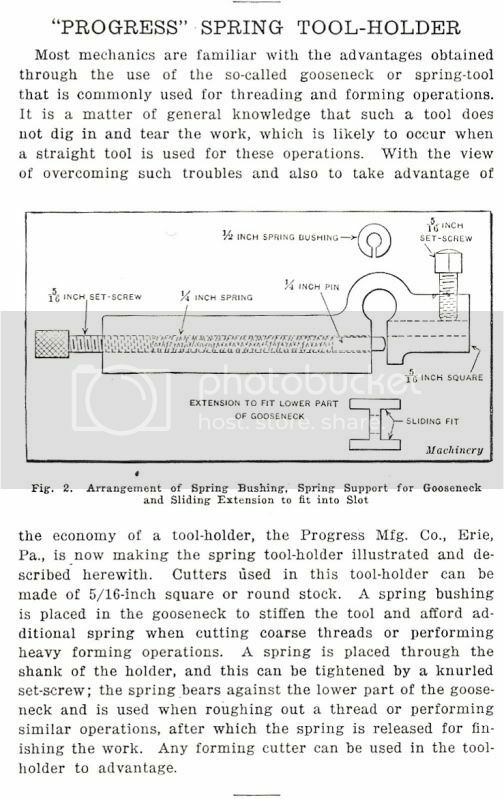 I was just digging through some old tool files and found this..... a nice factory made Spring Tool..... this is from Machinery (magazine) May 1917 pg. 822. Interesting! 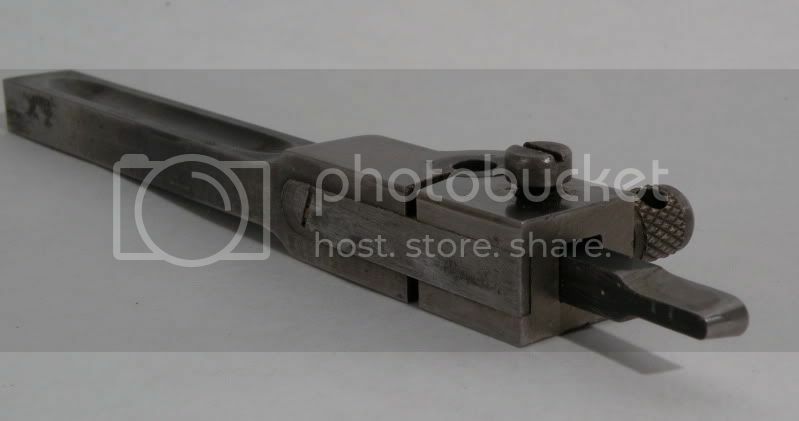 Especially the H-shaped block to be fitted into the lower part of the gooseneck, and held by the spring-loaded pin, when it is desired to have a "solid mount" for the tool. I had to puzzle over the drawing for a little bit before I realized that the H-shaped block is shown in a Plan view whereas the rest of the tool is shown in a Side view. 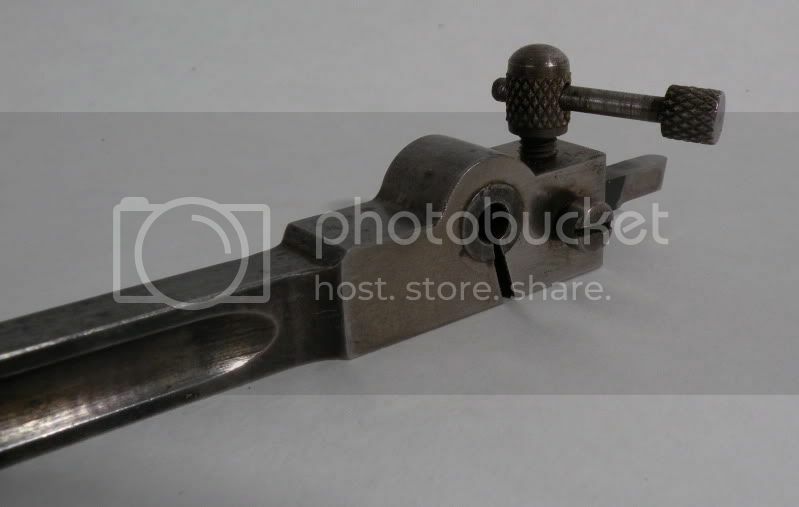 The final picture makes this clear - it shows the H-shaped block in place on the tool. Has anyone actually seen an example of this tool? Some shaper texts talk about placing the cutting edge behind the pivot point to reduce chatter and dig-in. I think that is all these holders are doing, just rotated 90 deg. Not sure how meaningful the spring part is. I certainly can't see the 1/4" spring in the Progress holder resisting cutting forces, unless you're cutting plastic or something. You are looking at three available springs in that tool holder. First is the loop built into the holder itself. Second is the 1/2 inch spring bushing to be placed inside the built in loop spring. Finally, you have the 1/4 inch spring. Those can be pretty stout depending on the number of coils and the diameter of the wire. It looks to me like you have a great deal of adjustment to meet the needs of different situations. FWIW ......armstrong , willard, williams, & shop made gooseneck tool holders are quite useful in my shop ...noticeable difference in straight in threading on Reed 1895 14 in , ( no factory compound ...rise /fall & xtraslide under xslide for taper attach. take the space ) thrds are cleaner ,like cutting w/ compound , & allow a heavier cut . as a test , i chucked a one in bar in the reed , used a 3/8 bit w/ a full width face , back rake & clearances & put a 60 deg point on the bar w/ a plunge cut at 144 rpm ...NO chatter ...this was a shop made holder....there was near 1/16 deflectiln , but when the point was approached , the deflection was not visible since the cut was minimal ....i have some question abt worring abt "truth "
I'm not saying they don't work, just questioning why they work. 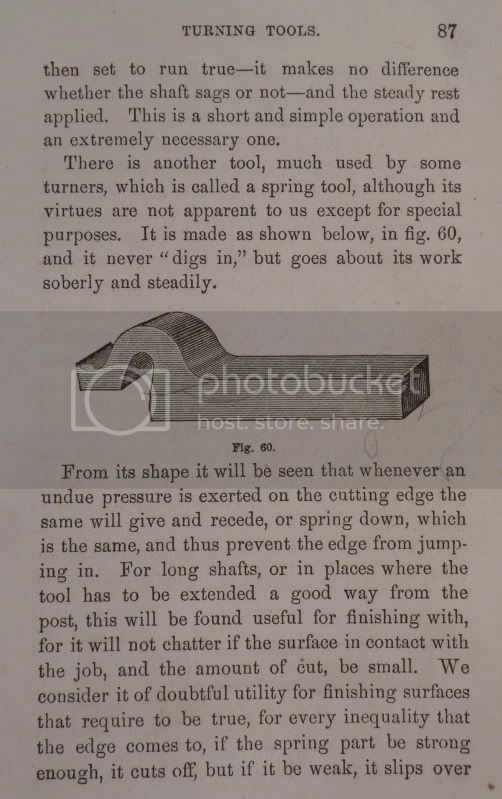 What would a goose neck/spring parting tool look like are they forged steel or were elaborate holders ever made to take standard parting blades so depth could be adjusted? The goose neck parting tool that I have is the only parting tool I have ever seen that provides rake to the blade.The rake is small but probably aids the cutting.The wrinkle with it is that the center height is different when you extend the blade.I use interchangable flat washers to keep the cutting angles consistent.If you were using a wedge you would cancel the rake. I just got this from ebay. 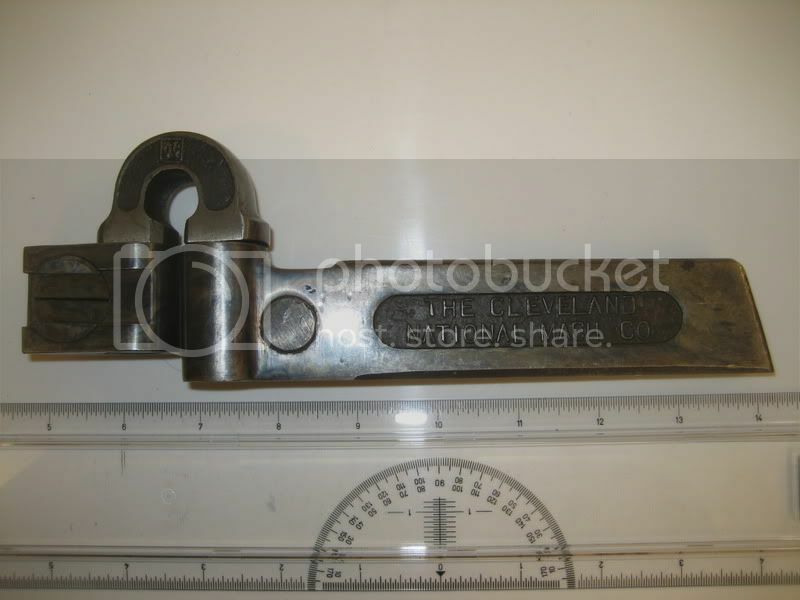 I believe it is shop made and not from a tooling manufacturer. It is nicely made though. didn't pay much for it. It has most of the design features discussed in the above posts. That's sweet..... it almost has a Art Deco look to it..... kind of Streamlined. Oh, yeah, that's a real winner! "Phil Barr" must have been a master machinist or toolmaker.